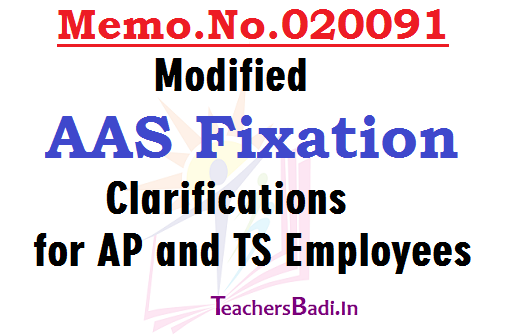 Memo.020091, AAS Fixation Clarifications,Fixation Clarifications on Modified Automatic Advancement Scheme for AP & TS Employees;RPS 2010, Clarifications on Modified AAS Fixation, Clarifications to clear the doubts on the new modified Automatic Advancement Scheme. AAS Fixation clarificatory orders. Public Services-Revised Pay Scales,2010-Modified Automatic Advancement Scheme-Certain Clarifications-Issued. 1. G.O.Ms.No.93, Finance (PC.II) Department dt.03.04.2010. 2. G.O.Ms.No.96, Finance (PC.II) Department dt.20.05.2011. 1. In the reference 1st cited, orders were issued for further continuation of the Automatic Advancement Scheme in the light of the recommendations of the Ninth pay Revision Commission on the Scheme. 2. In the reference 2nd cited, orders were issued modifying the Automatic Advancement Scheme by changing the periodicity from the existing 8/16/24/ to 6/12/18/24 years for appointments under this Scheme w.e.f. 01.02.2010. Whether this Scheme is applicable from the date of implementation of Ninth PRC i.e. 01.07.2008. If an employee completed (8) years of service in the ordinary grade before 01.02.2010 and availed benefit of Special Grade scale in the pre- revised Automatic Advancement Scheme, is he eligible for appointment to Six Years Special Grade Scale in the Modified Scheme. No. He is eligible for SPP-IA/SAPP-IA only, after completion of 12 years of service (subject to the condition that he is fully qualified to be promoted to first level promotion post) and so on. Consequent on introduction of new Automatic Advancement Scheme in G.O.2nd cited, if an employee completed (8) years service in the ordinary scale after 01.02.2010,whether he is eligible for Special Grade Scale in the Modified Automatic Advancement Scheme w.e.f. 01.02.2010 or from the date of appointment shall be revised and the completion of 6 years. He is eligible for Special Grade Scale in the Modified Automatic the Advancement Scheme with effect from 01.02.2010, if he happened to complete six years service as on this date. If an employee was appointed to the Special Grade scale on completion of 8 years of service after 01.02.2010, his appointment shall be revised and the benefit of SG (6 years) shall be given with effect from 01.02.2010 in the modified Automatic Advancement Scheme. If an employee completed (12) years - service as on 01.05.2007, whether he is eligible for SPP-IA/SAPP-IA from 01.05.2007 by taking the pay as on that date and making notional fixation till 01.02.2010, with monitory benefit from 01.02.2010. As per point 4 above, for computation of further spell of (6) years, whether it shall be counted from the date of sanction of SPP- IA/SAPP-IA i.e. 01.02.2010 or from 01.05.2007. In the case of point 4 above, for computation of further spell of (6) years appointment to SPP-IB/SAPP-IB,the six years period of service shall be counted from 01.05.2007 or by counting the total service of 18 years from the date of appointment in the same category. If an employee completed (15) years service as on 01.08.2010, whether he is eligible SPP-IA/SAPP-IA. Yes. He is eligible for SPP-IA/SAPP-IA w.e.f. 01.02.2010 only and his pay shall be fixed on the pay drawn as on 01.02.2010. He is further eligible for SPP-IB/SAPP-IB on completion of 18 years in the same scale / category. If an employee has availed 16 years scale in the old Automtic Advancement Scheme prior to 01.02.2010 whether he is eligible for appointment to the SPP-IA/SAPP-IA in the new Modified Automatic Advancement Scheme, as per the G.O. second cited. No. He is however eligible for SPP-IB/SAPP-IB in the same scale in the modified AA Scheme on completion of (18) years service in the category or post held by him and so on. If an employee has availed (16) years scale in the old Scheme and completed (23) years of service as on 01.05.2010, whether the employee is eligible for SPP-IB/SAPP-IB in the Modified Automatic Advancement Scheme. Consequent on introduction of modified Automatic Advancement Scheme in the reference second cited with retrospective effect (01.02.2010), if an employee was already appointed to SPP-II/SAPP-II on completion of (24) years service on 01.03.2010, is there any benefit to him in this new Modified Automatic Advancement Scheme. If an employee was appointed to SPP-II/SAPP-II on completion of (24) years of service prior to 01.02.2010 in the old scheme, is there any benefit to him in this new Modified Automatic Advancement Scheme. No benefit shall be allowed to the individual, since he had already availed 8/16/24 years scales in the older version of the Automatic Advancement Scheme that was existing prior to 01.02.2010. Whether the employees who were not covered between the Grades XXI to XXV in the previous PRC (2005) shall forego the Automatic Advancement Scheme. No. Government have issued orders in G.O.Ms.No.93, Finance (PC.II) Department dt.03.04.2010 by extending the Grades upto XXV for eligibility ofAutomatic Advancement Scheme.